Feathers is a cute iPhone app for creating even cuter tweets. The $1 app from Naklab isn’t a full-fledged Twitter client—you can’t read tweets with it. Like Birdhouse, it’s strictly an app for composing tweets… with a twist. 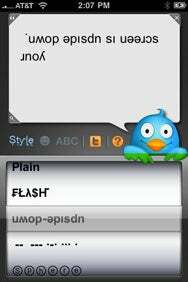 Tweet Tweaker: Feathers gives you more than a dozen ways to style your posts to Twitter, including turning your tweets upside-down. After you’ve tapped out your missive in Feathers, you can choose from more than a dozen ways to style it. Taking advantage of all the characters available to use in a Twitter post, Feathers can let you style your tweet with decorative characters, flip it upside-down, put dots above and below each letter, give each letter tails, and even make tweets look as if they’re written in pseudo-Greek or Russian. On top of those fanciful styles, Feathers can also convert your status updates into Morse code or l33t-speak. Feathers even keeps one bonus feather in its feature-set cap: The app also makes it a snap to browse more than 200 Unicode characters that you can drop into your tweets—smiley faces, radioactive symbols, musical notes, and more. The app’s interface is minimal—essentially limited to one screen—but it’s adorably designed, with a delightfully drawn bird that you press to post your tweets. Not all of us can tweet gems every time we post. If your tweets always seem to be missing that special something, and that special something is “silly, fun accoutrements,” then flock to the App Store and snag Feathers.